As we round out the year, I’d like to reflect on what in my view are the five most important criminal law decisions from our higher courts in 2014. At number five is HKSAR v Krieger, a case of alleged bribery of Macau’s Ao Man Long, in which the defendants were acquitted in the Court of Appeal and the prosecution was denied leave to appeal further. This case held that it is not a criminal offence to form plans in Hong Kong to bribe an overseas official. It exposed another loophole in our bribery laws, taking us further away from compliance with our international obligations. At number four is HKSAR v Singh Gursewak, a recent decision of the Court of Appeal, in which a man charged with theft and fraud was tried in absentia (in his absence) in the District Court and convicted. In allowing the defendant’s appeal, the court reminded us of a basic common law principle that trials in absentia are “rare and exceptional…particularly if the defendant is unrepresented”. It was not enough that the unrepresented defendant had “deliberately breached their bail conditions and had absconded”. At number three is HKSAR v Tso Kin Shing, another decision of the Court of Appeal, which illustrates how a defendant, without legal representation, can be severely disadvantaged. The defendant was convicted of serious sexual offences and sentenced to eight years imprisonment. In the jury trial, the admissibility of a confession statement was not tested even though police abuse was alleged, the defendant’s closing speech was “cut short”, while the senior prosecuting counsel made a closing speech when he was not entitled to. The trial was found to be unfair and the appeal was allowed. Leave to appeal to the Court of Final Appeal was denied. At number two is the Court of Final Appeal’s decision in HKSAR v Pang Hung Fai, which narrowed the ambit of the money laundering offence. In deciding whether a defendant had grounds to believe property he dealt with represented the proceeds of an indictable offence, the test is now whether anyone looking at the grounds objectively would (not could) so believe taking into account the defendant’s knowledge, beliefs, perceptions and evaluations. The court acquitted the defendant and said that the new approach had “a strong element of moral blame”. To top the list is the case of HKSAR v Hon Ming Kong, not for what the case said about the law, but for what former Vice-President of the Court of Appeal, Mr Justice Frank Stock said in his 31 paragraphs of preamble, in which he chastised the lawyers for delay and the “extraordinary” waste of public funds and expressed the “urgent need” for criminal justice reform. A change from the “adjournment culture” that has developed was “long overdue”. He reminded lawyers of their “professional duty…to ensure that the wheels of justice run smoothly”, a duty “not at all at odds with their duty to the client”. It is remarkable to see that there are still unrepresented defendants being tried on serious charges and that none of these five cases involved constitutional points. 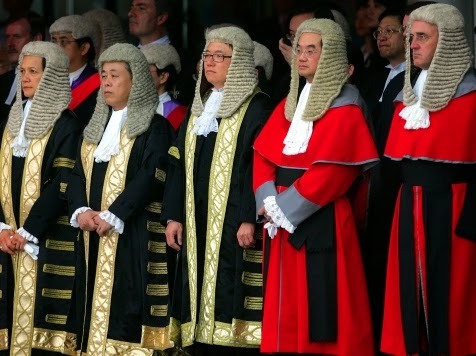 We might ponder over Christmas turkey whether constitutional rights litigation in Hong Kong criminal cases is now dead. Written by Simon NM Young. An edited version of this article was published in the South China Morning Post on 23 December 2014.